If you’ve come to regard gnocchi as stodgy or heavy, you aren’t alone. Many North Americans do, but they haven’t tried the light as a feather versions made in Calabria. Of course, Calabrians have a distinct advantage; their potatoes are delicious and have an almost sweet flavour. But any really good potatoes can be turned into these delicious pasta pillows. One trick is to score the surface of the gnocchi so they cook more quickly without becoming soggy. Antonio D’Ippolito in front of his stove. 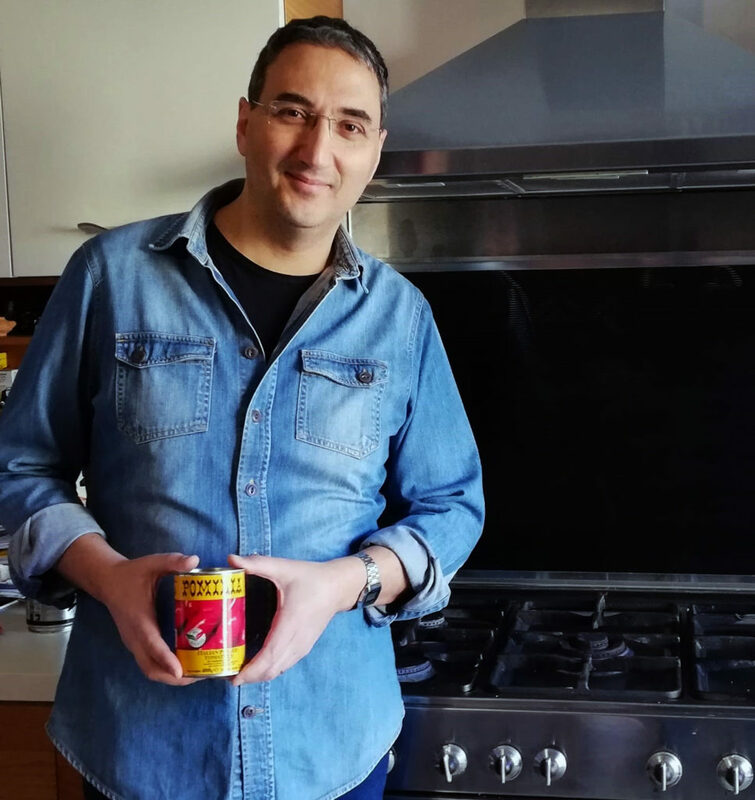 He’s holding his favourite tinned tomatoes which add flavour to his sauce. Our local Soverato friend Antonio D’Ippolito is a helpful travel agent and terrific tour organizer who likes to cook in his spare time. This is one of his specialties and the photos are of him preparing his own gnocchi. Boil the potatoes in enough cold water to cover them and simmer. Remove from heat when fork tender. Drain the potatoes, and when cool, peel them. Ideally, use a potato ricer but failing this, mash them very well, until there are no lumps. On a lightly floured surface, add the egg to the mashed potatoes and then add the flour and salt. Mix with your hands until moistened; the dough will be crumbly but will begin to clump. Gather the dough together and knead gently for about a minute until the flour is fully incorporated and the dough is soft, smooth, and a little sticky. Over-kneading will make the gnocchi tough. Move the dough to one side on the floured surface and cover with a clean kitchen towel.Spread parchment over two large rimmed baking sheets sprinkle lightly with flour. Clean off and lightly re-flour your work surface. Tear off a piece of dough about the size of your fist and put the towel back to prevent the remaining dough from drying out. Roll it into a rope about 2 cm in diameter. With a sharp knife cut the rope crosswise every 3 cm to make the gnocchi. Arrange them in a single layer on the baking sheets. Repeat until you run out of dough. Using a fine cheese grater, press gently on the surface of the gnocchi to score them. This is one of the secrets of really good gnocchi. 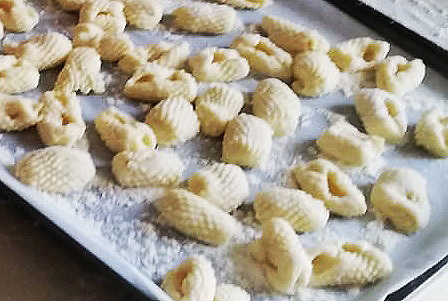 The gnocchi are scored on the surface. Drop gnocchi in small batches in boiling salted water for just a minute – until they rise to the surface. Scoop out. 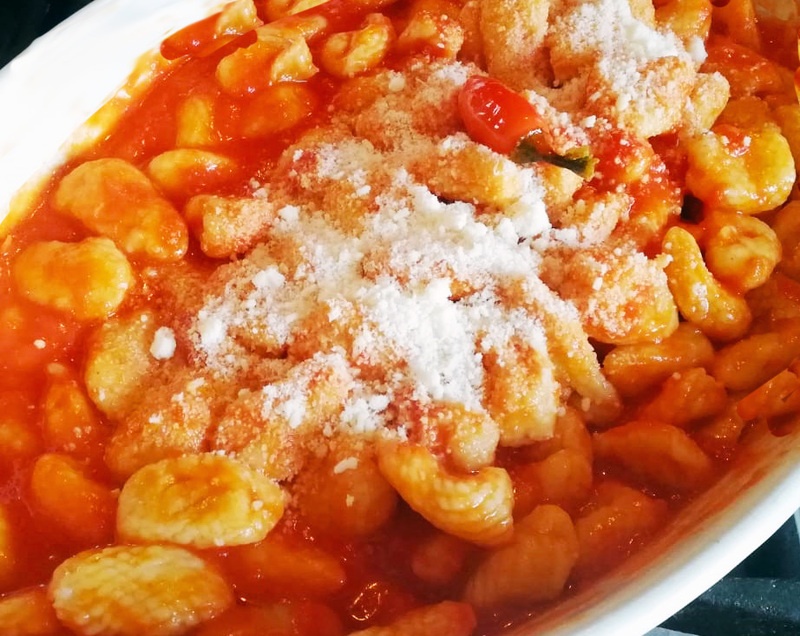 Make your favourite tomato sauce and drop the gnocchi into it for a superb Italian supper. And don’t forget the grating of good Parmigiano for the top. 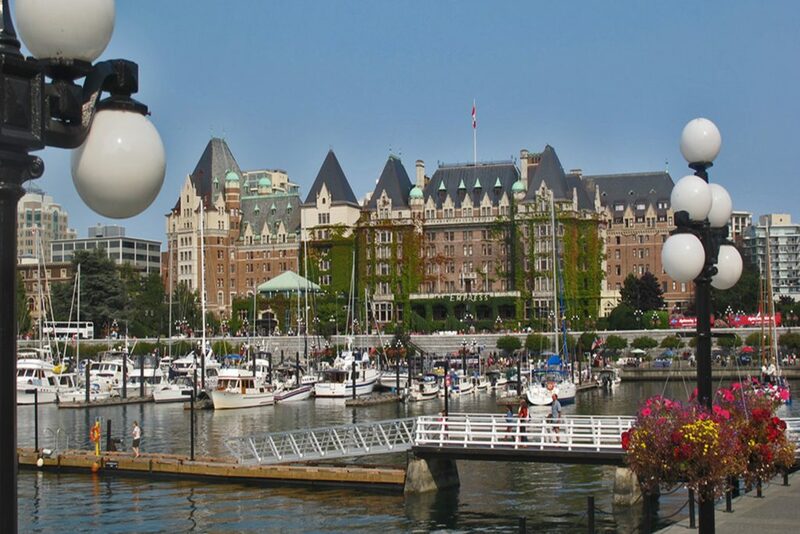 The venerable Empress Hotel dominates the waterfront in Victoria. I started making Christmas cookie canes when my children were little. They were my alternative to pure sugar candy canes; we even hung them on the tree. There’s just one cup of icing sugar in 48 cookies! My kids loved them and they continue to be a favourite with my grandchildren. They are undoubtedly fiddly to make, but well worth the effort. And when the children are a little older, they can help make them. They actually enjoy rolling the little pieces of dough into snakes, though they may need help twining them. By the way, I make the dough in my Cuisinart food processor. When I add food colouring to half the dough, I use the Cuisinart to blend the colour into the dough. It makes the whole job soooo much easier and faster. The time-consuming bit is dividing the red dough and the plain dough each into 48 small lumps. Note: start by dividing each colour ball into quarters and divide each quarter into 12 small balls and roll these before starting on the next quarter. Working on one at a time prevents the remaining dough from drying out while you roll. Mix the butter, shortening and sugar very well. Add the egg and flavouring and blend well. Finally, blend in flour and salt. 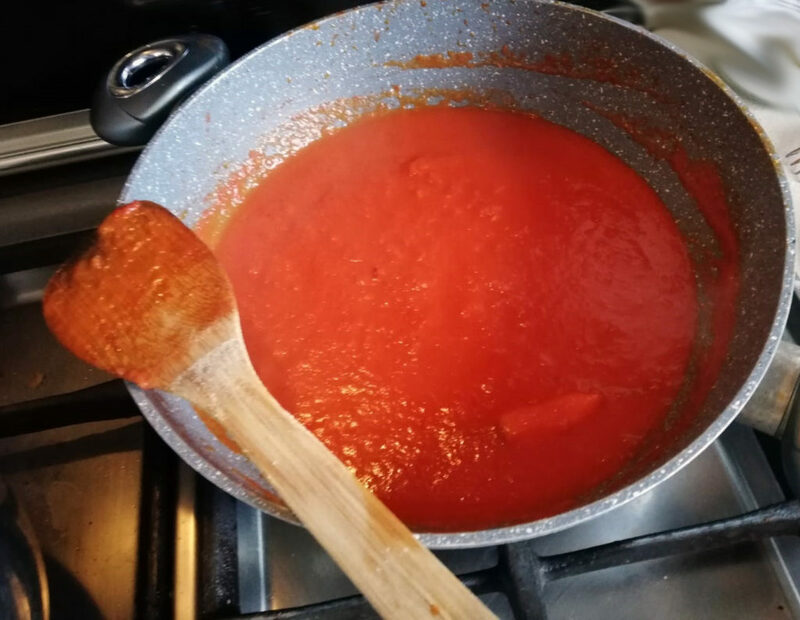 Divide the dough in half and colour half with the red colour. Divide each colour into four equal balls. Each ball should produce 12 teaspoon-sized pieces of dough. 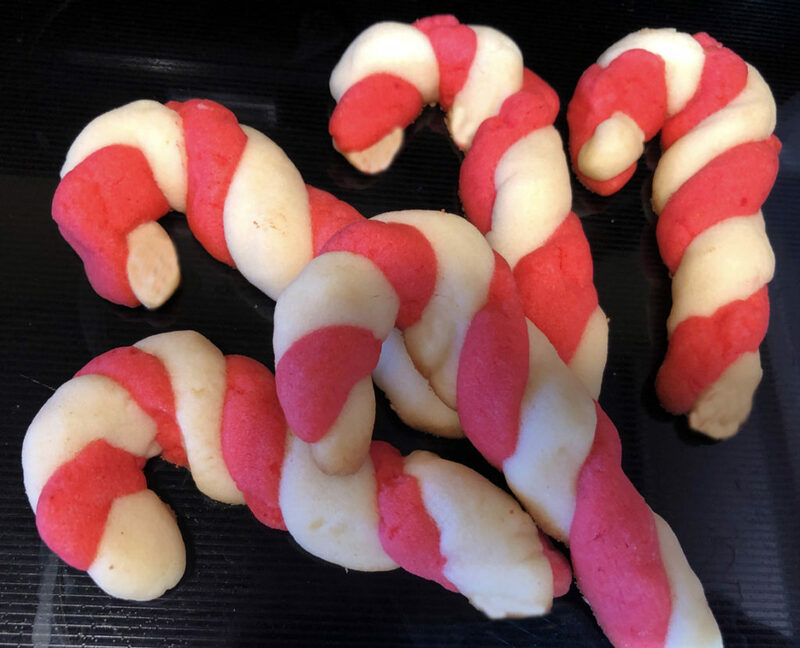 Roll one red and one plain piece into snakes, then entwine the snakes to form a cookie cane with a curve. Place on an ungreased cookie sheet to bake for 9 minutes. DO NOT brown. Cool on a rack. Enjoy! Put delicate shortbread and zippy ginger together for a perfect holiday treat. The sweet holiday season is upon us. Decadent chocolate, gooey caramel and super-sweet peppermint are all nice, but to my mind, nothing beats a well-made shortbread cookie. That rich, subtly sweet, melt-in-your-mouth flavour just can’t be topped by any iced sugar cookie or bar. Like most, I have shortbread recipes and will go to the wall to defend why they are the best. 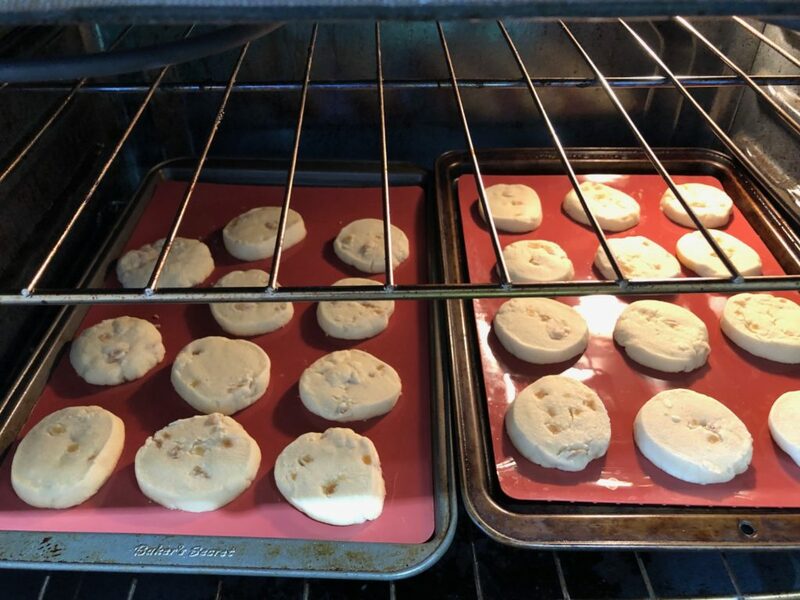 Regardless, any recipe worthy of the shortbread name will include the same fundamental ingredients: real butter, sugar and flour. The variations thereafter are as numerous “as sand on the seashore”. It will come as no surprise that shortbread traces its roots back to the peasant class of Scotland. Shortbread’s predecessor was bannock (biscuit bread), made by baking leftover bread dough on a very low heat until it hardened into what we might call a cracker today. Over time, the yeast was replaced with butter and the flour with oats, creating a rich, crumbly biscuit. The earliest shortbread was flavoured with caraway seeds and it is said Mary Queen of Scots was a fan. In fact, she is credited with boosting shortbread’s popularity by making it acceptable for the rich to eat this with tea. Over time the wealthy replaced oats – the grain of the common people – with flour and sugar – only used by the upper classes because of their cost. And the shortbread we know today was born. 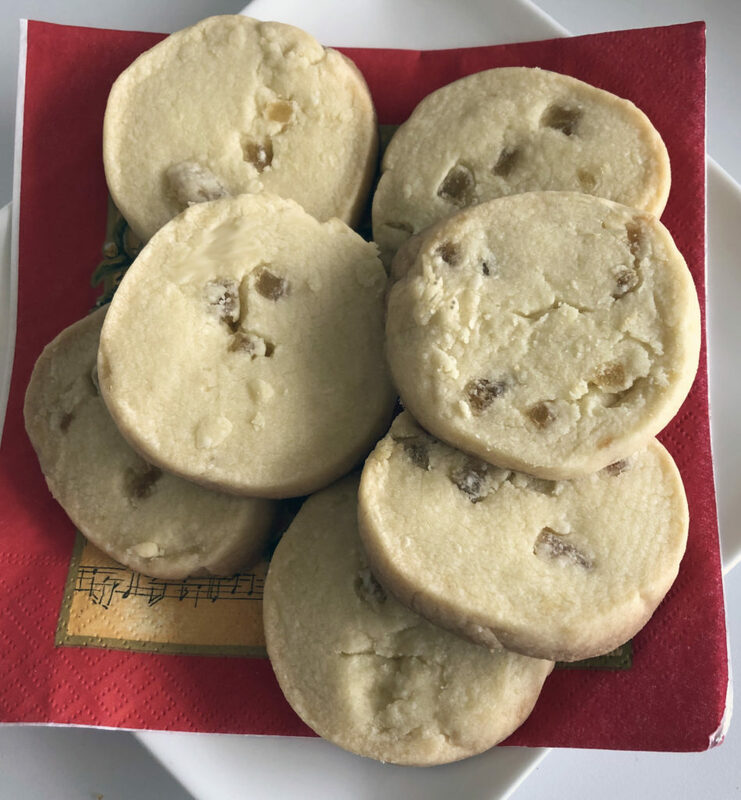 Our family’s favourite shortbread comes from a recipe provided by a cooking instructor and friend, Jan Knox. Jan is no longer with us, but her recipes has been delighting my family for 30 years! A favourite with our friends and family. I use a food processor for easy preparation but the ginger must be incorporated by hand. I don’t add the ginger powder but do if you like it really gingery. 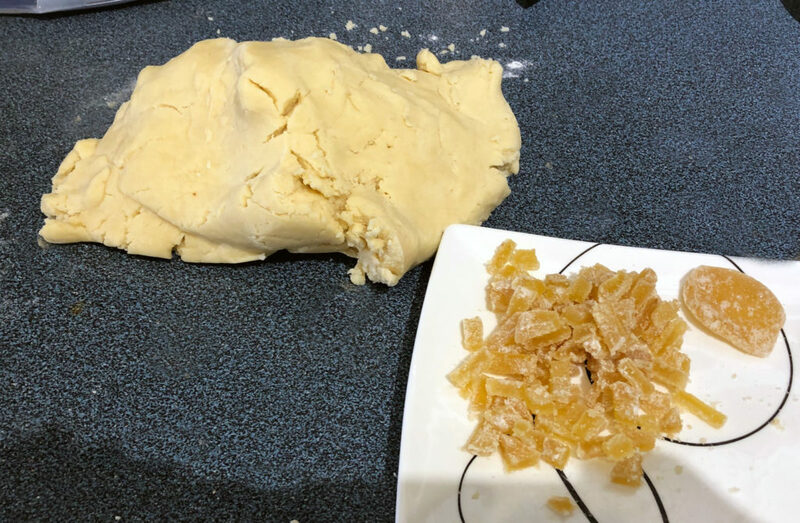 BTW, I’m generous with the crystallized ginger measurement! Blend the butter until smooth and work in the sugar, then flour, ground ginger and salt. Once you have a ball of dough, work in the ginger with your fingers. Compact into a long roll in waxed paper and refrigerate for at least two hours. Preheat oven to 325 F. Cut into ¼ inch slices. Bake on an ungreased baking sheet for 8-10 minutes. Be careful not to overcook; the edges should just be starting to turn golden.